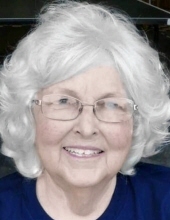 A memorial visitation for Judy Marjean Baker, 74, of Denison will be held from 6:00 to 8:00 pm Thursday, February 14, 2019 at Scoggins Funeral Home in Van Alstyne. She passed away Friday, February 8, 2019 at Texoma Medical Center in Denison. Judy was born September 16, 1944 in Sherman, Texas to Wayne and Annie Lee Dyer Davis. She was a graduate of Van Alstyne High School and retired from Johnson N Johnson. Judy, also loved Elvis Presley. Judy is survived by her daughter: Leslie Flinn and husband Rodger. Brothers: Jerry Bob Davis and Wayne “Son” Davis. 4: Grandchildren numerous Great-Grandchildren, Aunts, Uncles, Niece, Nephews and Cousins. She is also survived by her precious little dog Scrappy. Services are under the direction of Scoggins Funeral Home & Crematory, 637 W. Van Alstyne Parkway, Van Alstyne, Texas. 903-482-5225. You may sing the online guest book at www.scogginsfuneralhome.com. To send flowers or a remembrance gift to the family of Judy Marjean Baker, please visit our Tribute Store. "Email Address" would like to share the life celebration of Judy Marjean Baker. Click on the "link" to go to share a favorite memory or leave a condolence message for the family.